We at the Open Mainframe Project are thrilled at the technical progression and the community support of Zowe. Launched just seven months ago, we announced the 1.0.0 milestone last month and have had more than 664 downloads of Zowe to date! We’ve even seen some cool integrations – Alex Kim, a mainframe engineer and architect with Vicom Infinity, developed a VIVA, a virtual assistant for interacting with your mainframe! 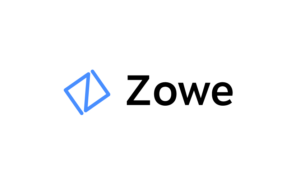 As the community grows and continues to advance the support of Zowe, the project invites everyone in the mainframe ecosystem to contribute and get involved in the work. Learn more about how to become part of the community in this blog post. We would also urge everyone using Zowe beta releases v0.8.x and v0.9.x to move to the latest v1.x.x release, as the beta releases will no longer be supported or maintained. The v0.8.x and v0.9.x releases of Zowe will not be available for download after May 31st, 2019. Questions? Comments? Join our Slack channel to continue the conversation: https://slack.openmainframeproject.org/. And this is where each of you in the community comes in – help us find projects that students could work on this upcoming summer. Publishing guides on how to get an open source tool going on mainframe ( for example the guides built for Kubernetes on SLES, Ubuntu, and RHEL. Post the idea to the TSC email list . Submit it as a pull request to proposed projects folder on the TSC GitHub repo using the suggested template. Both users and non-users of Linux on Mainframe generally agree on Linux on Mainframe’s strengths of performance, security, and cost reduction. The growth of Cloud Computing is perceived as an augment to mainframe, not as a replacement. Mainframe will continue to have a key role in an ever hybrid computing world. Check out the whitepaper and also look to our other techbriefs and videos for insight on the modern mainframe. Announcing the 2018 Open Mainframe Project Summer Interns! Growth of students interested in open source on mainframe has been impressive to say the least – each summer we’ve had more than a 100% increase in applicants for the summer internship program. This is a true testament to the market demand and modern relevance of open source on mainframe. We are pleased to announce this summer’s internship class, along with the project mentors and projects they will be working on! Keep an eye on the project blog, as well as the community forums and Twitter for updates on these projects! Editor’s Note: This blog post comes from Neale Ferguson of Open Mainframe Project member organization Sine Nomine Associates. He shared with the technical community that ClefOS, which is a Linux distribution for System z intended to fill the need for a royalty and license free operating system for appliance and utility system construction by anyone wishing to deploy applications on System z hardware, now has an official Docker image. In this post he describes what this means for ClefOS and how you can learn more. Provide essential base OS repositories (for example, ubuntu, centos) that serve as the starting point for the majority of users. Provide drop-in solutions for popular programming language runtimes, data stores, and other services, similar to what a Platform-as-a-Service (PAAS) would offer. Exemplify Dockerfile best practices and provide clear documentation to serve as a reference for other Dockerfile authors. Ensure that security updates are applied in a timely manner. This is particularly important as many Official Repositories are some of the most popular on Docker Hub. In addition, the images held in the official repository are scanned using Docker Cloud’s Security Scanning Service, the results of which, provide valuable vulnerability information. So what this means is, if you are planning a project that involves the use or creation of Docker images then those that are based on an official image offer a high degree of confidence that the image you are using is what it says it is and contains no malware, backdoors, or trojans. In addition, it ensures that these images are regularly updated and well maintained. IBM’s former systems and technology CTO Len Santalucia explains when it makes sense to buy a mainframe and what the advantages are. Editor’s Note: This post comes from Anna Shugol, Blockchain IT specialist and zChampion from IBM Montpellier Client Center. Last fall, she lead a Blockchain hackathon where students used mainframe for building their applications. Open Mainframe Project sponsored this event, just as it sponsors internships and other education efforts on mainframe around the world. Blockchain is a cutting edge technology and has all the potential to change the way how business is done across many industries. The spark that has initially ignited the enterprise world has gone way further. It is interesting to watch how blockchain technology is being so rapidly adopted not only in the business sector, but also by emerging startups, IT developer communities and students. The latter bring new fresh ideas, solutions with a combination of different technologies and as a result – projects that have all the potential to revolutionize all industries. IBM has been always supporting students and all IT developers and enthusiasts in their innovation discovery journey and what can be more fun than exploring emerging technologies through the hackathon? Considering this IBM Montpellier Blockchain Center of Competency and Open Mainframe Project have launched a Blockchain Hackathon for EPSI University in France. During 5 days approximately 300 students from 9 cities in France were collaborating together under the guidance from worldwide IBM Blockchain specialists to design new creative solutions and projects. We were delighted to see students’ enthusiasm and innovative thinking – their projects were aimed to change the retail, healthcare and public industries. Students were using Hyperledger Fabric (http://hyperledger-fabric.readthedocs.io/en/latest/), an open source blockchain framework developed under the governance of the Linux Foundation to produce their own creative solutions. Hyperledger Composer, also an open source IDE platform (https://hyperledger.github.io/composer/) was used as a tooling for developing blockchain networks. IBM LinuxONE Community Cloud and Developer Journey (https://github.com/IBM/hyperledger-fabric-on-linux-one) provide an environment to accelerate solutions’ deployment. Anyone can sign up for free trial access to LinuxONE Community Cloud and follow the Developer Journey scenario to create their own solutions. The combination of open source technologies and LinuxONE -an enterprise Linux sever – allowed students to make the best out of this two worlds. 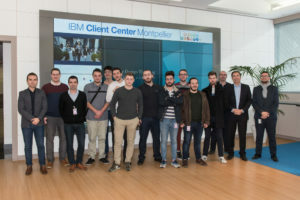 Open Mainframe Project and IBM decided to invite two winning teams to IBM Montpellier, where the students have spent the full day working with IBM Blockchain specialists, discovering how they can make their solutions even better, and also learnt about IBM Quantum Computing, Cloud and other fast paced technologies. We hope that this is a start of a great collaboration between IT professionals and students and a foundation for a successful future. Congratulations to the Blockchain Hackathon winners! IBM Montpellier Blockchain Center of Competency would like to thank Jennifer Foley, Steve LaFalce, Eva Yan, John Mertic and Open Mainframe Project for their outstanding support. Make mainframe support a new year’s resolution for your open source project for 2018! Mainframes make an impact on each of us every day – whether we get paid, take a plane, use a bank, or even shop in a store. 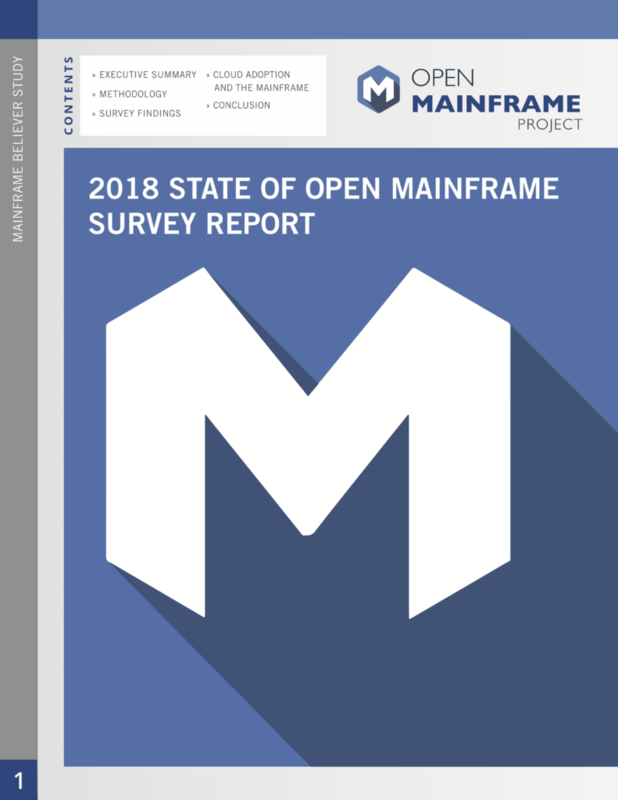 Increasingly open source software is a key piece of the stack powering these application – over 90% of mainframe user run Linux and a recent Open Mainframe Project survey found that over half of the workloads on mainframe are using open source components. Access to mainframe hardware for testing and continuous integration. Connections with experts in mainframe for ideas on best practices and resources for supporting s390x code in your project. Prominence with the top mainframe users worldwide to gain adoption of your project. Open Mainframe Project has been funding work on open source since it’s inception, supporting platform adoption of open source projects such as OpenStack, Docker, Alpine Linux, Tensorflow, HyperLedger, and others. Interested in exploring mainframe support for your project? Contact us at info@openmainframeproject.org for more information. Want to hack on mainframe next summer? Our Summer 2018 Internship Program is now accepting applications! Updated 2018/01/14 with link to new community topic on project ideas. Mainframe skills are in high demand, with the 10 top insurers, 44 of the top 50 banks, 18 of the top 25 retailers, and 90% of the largest airlines, using mainframe as the backbone for computing infrastructure according to IBM. Linux and open source are increasingly used more and more on mainframe; IBM estimates 90% of it’s customer base leverages Linux on mainframe, and a recent Open Mainframe Project survey found that over half of all workloads in these enterprises are ran by Linux on mainframe. This means that there are great opportunities for students looking at a future career in mainframe. If you are a student reading this – we have a unique opportunity for you. Spend your summer using your open source and Linux skills, learning about and contributing to the future of mainframe in our annual summer internship program. This program pairs a student with a mentor from one of our great member companies, which results in a contribution to driving open source and Linux on mainframe. Past students have built Docker containers, created applications on HyperLedger, and even ported a new Linux distribution to mainframe! You can be a part of this legacy, learn new skills, and potentially open yourself up to career opportunities coming out of the program. You also get a healthy stipend ( $6,000 USD ), a fully paid trip to a technology conference to showcase your work, and networking opportunities with peers and leaders in the industry. If this sounds interesting to you, you can apply for the program now – please note the application period closes February 16th, 2018. And look for our past interns in the community forums, and look in the coming weeks for more posts from them on their experiences. Looking for help on putting together your project proposal or have a new idea on a project you would like to work on around mainframe and open source? Check out the new community forums topic where you can connect with former mentors and interns for help!